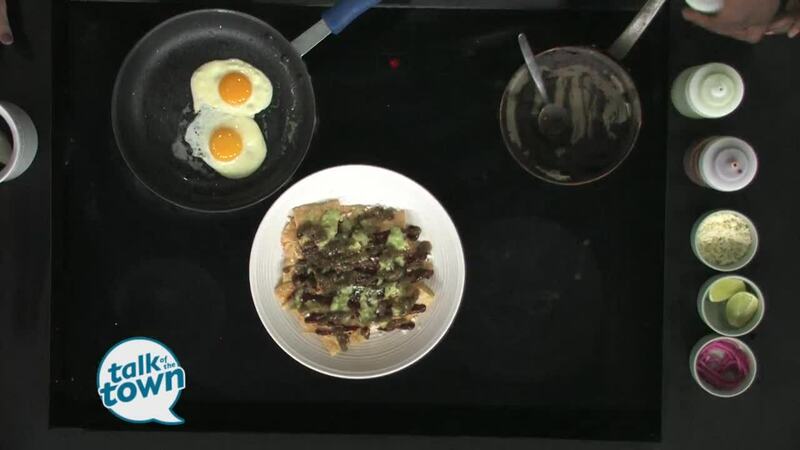 Executive Chef Simoni Kigweba from Stay Golden Restaurant and Roastery made Chilaquiles - a Mexican breakfast dish. (see recipe below) Stay Golden has 2 locations in Nashville - the original, at 2934 Sidco Dr. #130 and Stay Golden East, located at 901 Woodland St in East Nashville. Get all the details online at www.stay-golden.com . Spoon black bean puree over mixture. Place salsas and cotija cheese over chips. Garnish with fresh red onion. Top dish with two sunny side eggs. Toast garlic over medium heat in flat bottom saucepan for four minutes or until garlic is fragrant and browned. Add mixture to food processor and blend until homogenous.